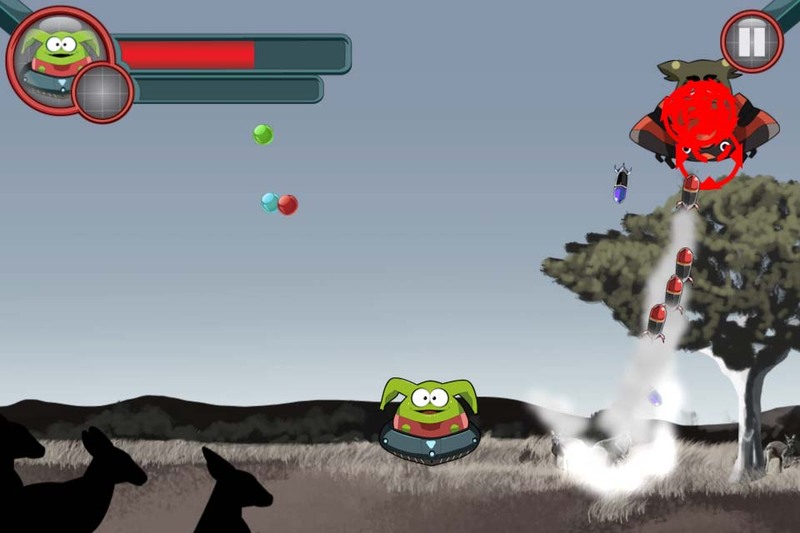 10 word description: Blast rockets at Dr Bleach’s evil henchmen. Power-ups. Game Center. 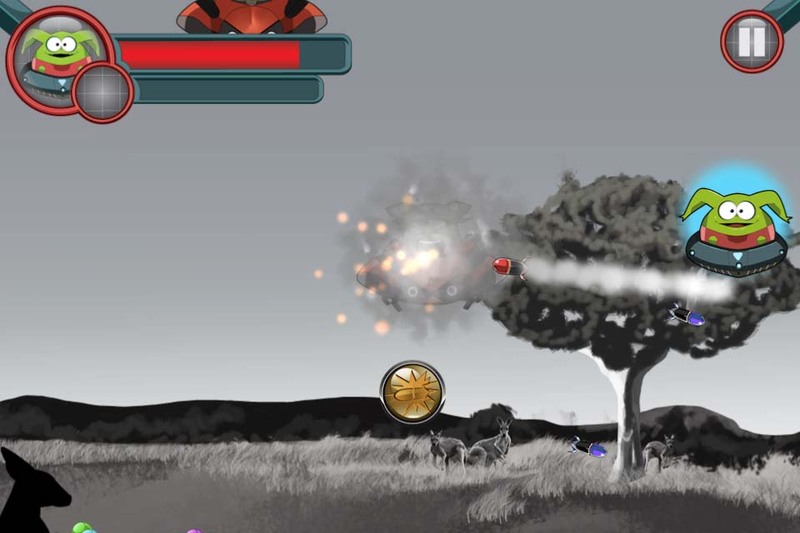 10 word review: Tilt ‘n’ swipe shooter with IAPs. Screen feels rather cramped. 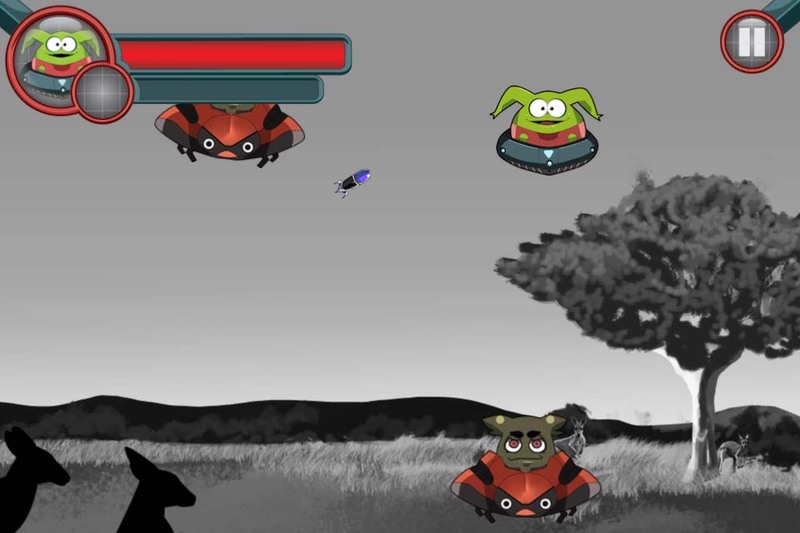 You will like this if you enjoy: Tilting to control one flying saucer while swiping (not tapping) at other flying saucers. The bad news: … I couldn’t think of anything. Arcadelife verdict: How you interpret the bad news section above is entirely up to you. 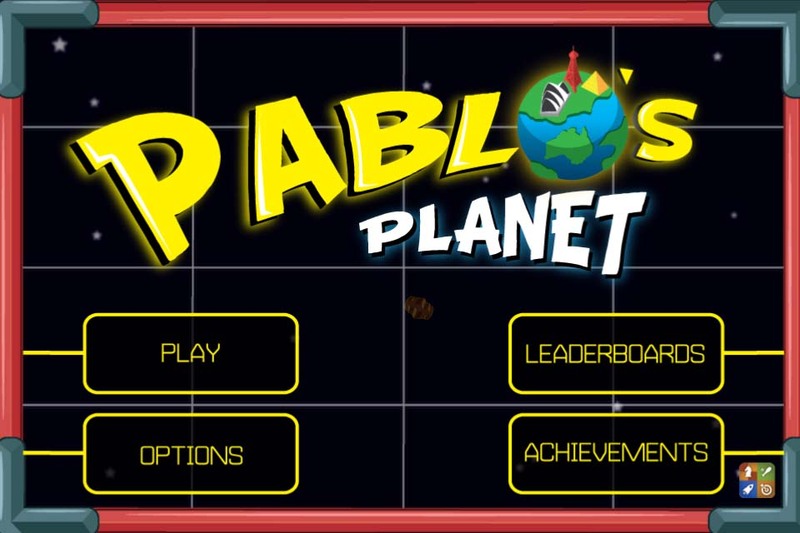 There’s nothing fundamentally wrong with Pablo’s Planet, but the rather strange mixture of tilt control, shooter gameplay and Fruit Ninja style swiping to target enemies never really feels quite right. 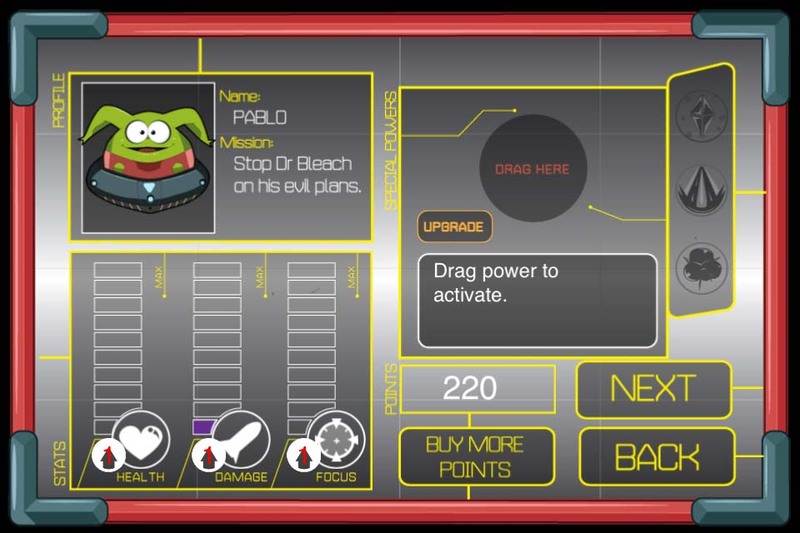 Upgrading is a bit of a grind, with the predictable IAP option to bypass the chore of actually playing the game. This isn’t one I’ll be going back to. 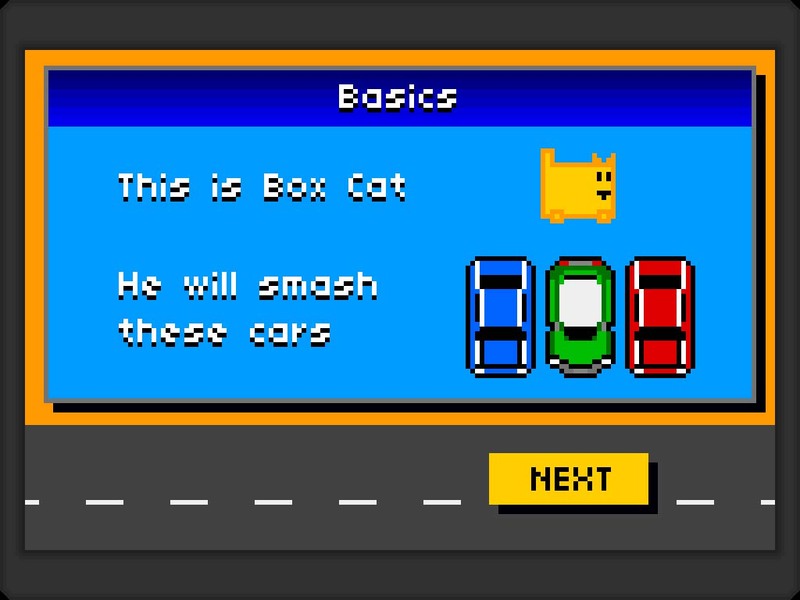 10 word description: Smash Box Cat into cars and create traffic mayhem. Game Center. 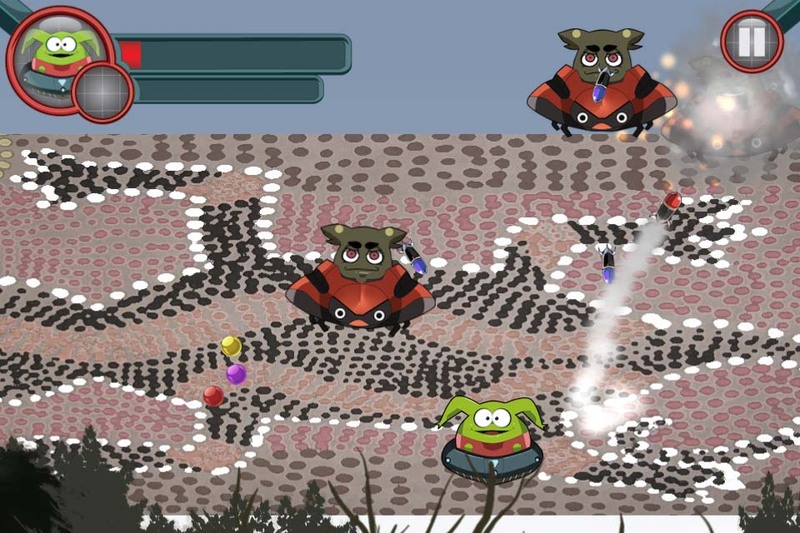 10 word review: I’m really not worthy of reviewing this bizarre, wonderful game. 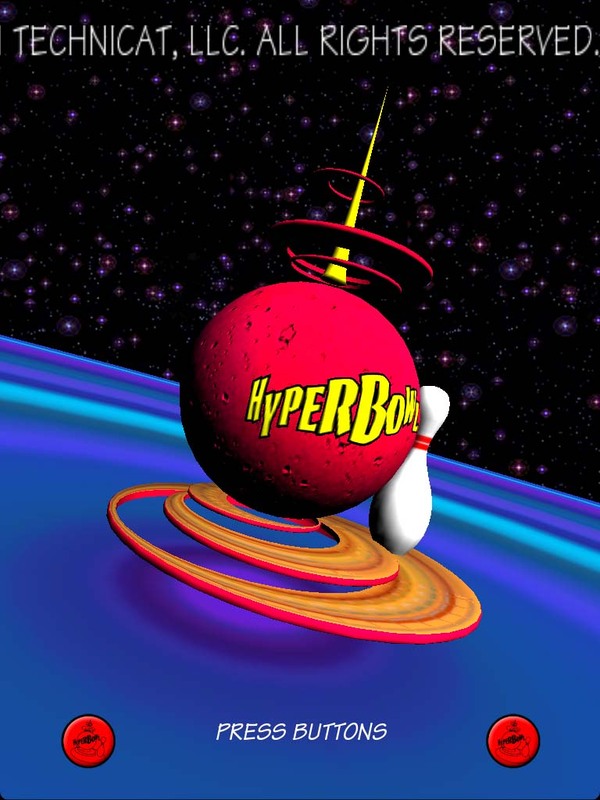 You will like this if you enjoy: Bonkers video games from a time when everyone was a lot happier. The good news: It’s very silly, but in a Bill and Ted way, not a UK Government way. 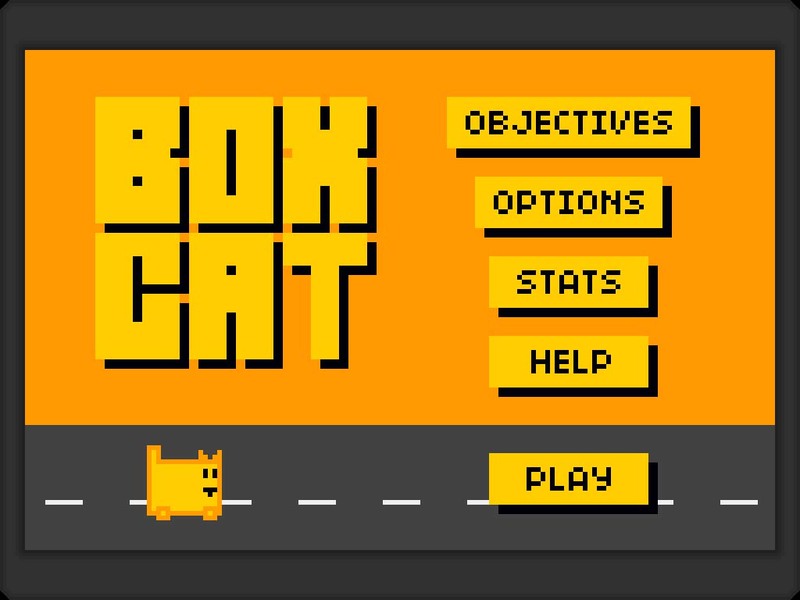 Giant square cats are awesome; we all know that. 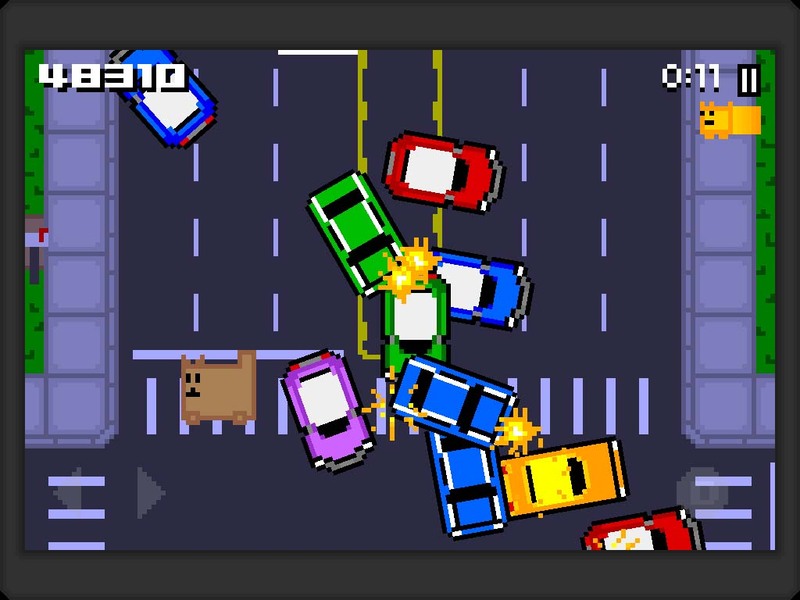 The bad news: You’re not a giant square cat and you can’t run into traffic and smash cars around. I just thought I’d point that out. Arcadelife verdict: The way I feel, this is the best game that I could be playing today. 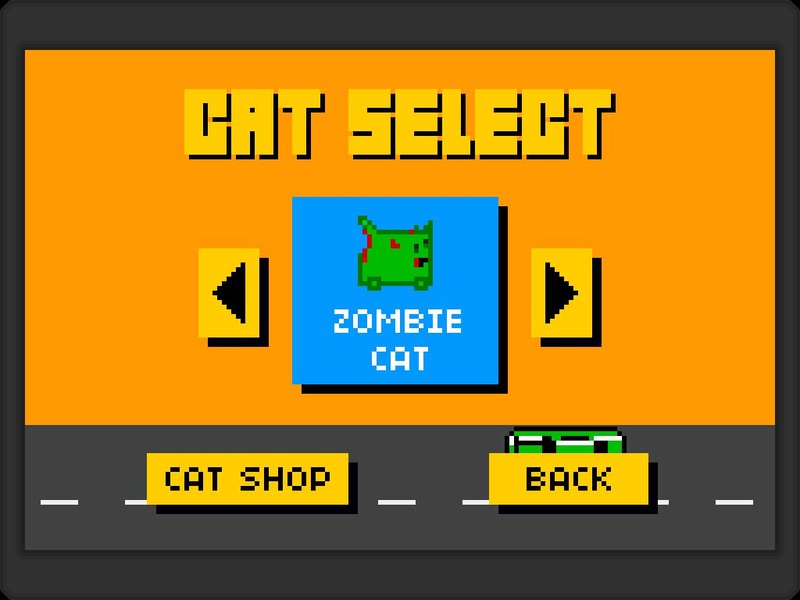 Wrap your head around this concept: You guide a large square cat back and forth, left and right, across a busy road, smacking cars into one another and causing combo car crashes. 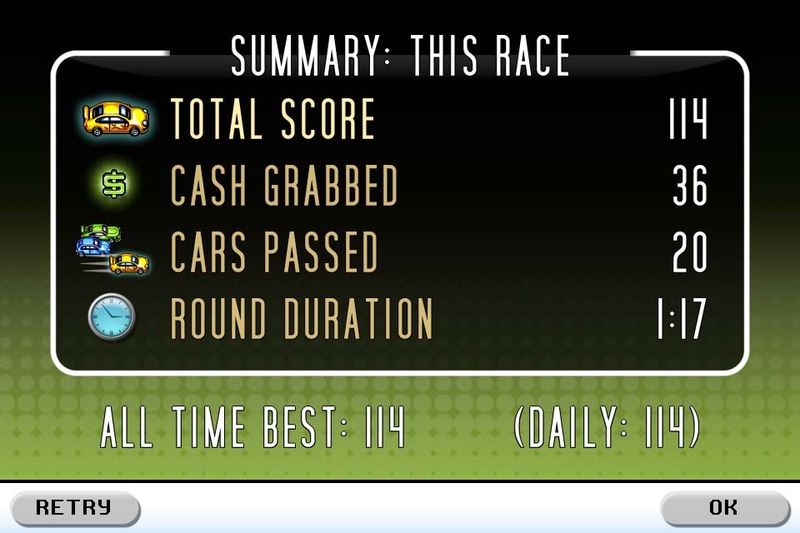 (My best so far is a 51 x combo in rush hour mode). There’s no reason for any of this and it remains bafflingly ridiculous, the craziness escalating exponentially with every weird new cat character that you unlock. In my view, this is an essential game. 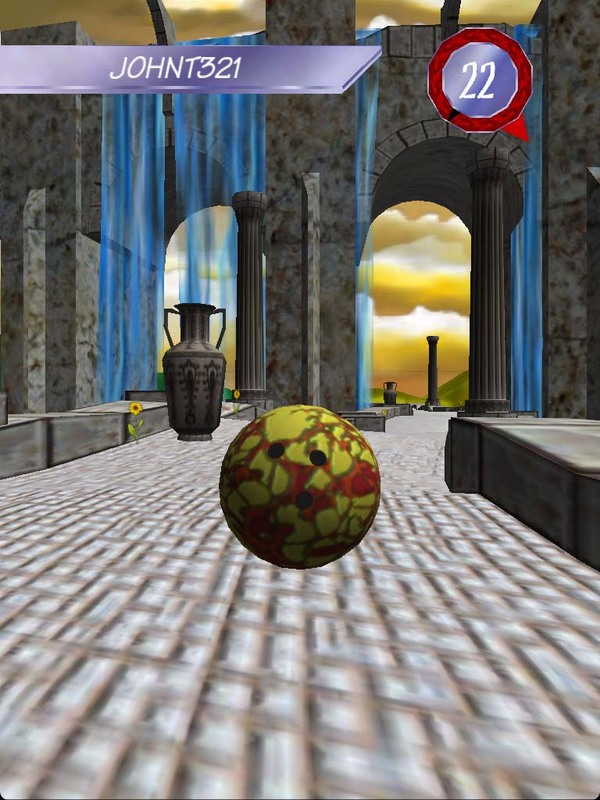 10 word description: Projectile physics puzzler; 75 3-star challenge levels. Game Center. 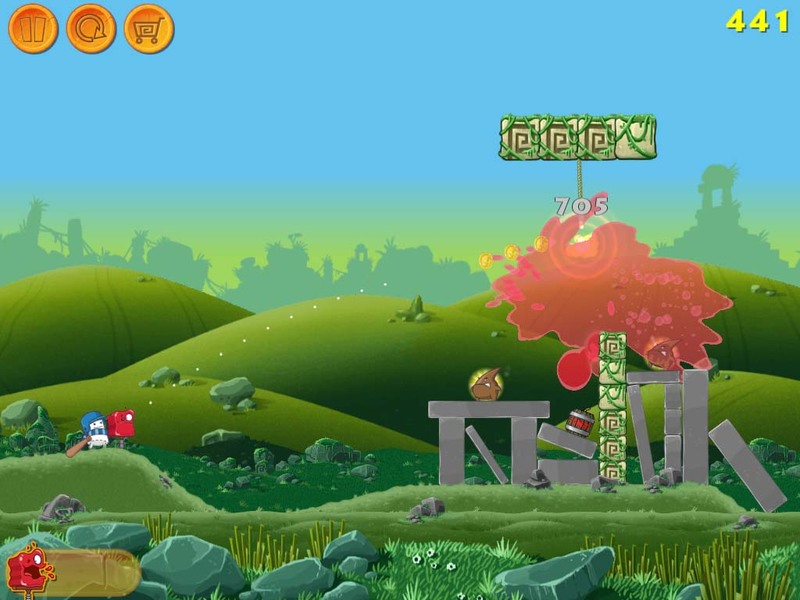 10 word review: Fairly interesting Angry Birds imitator, but still the same game. 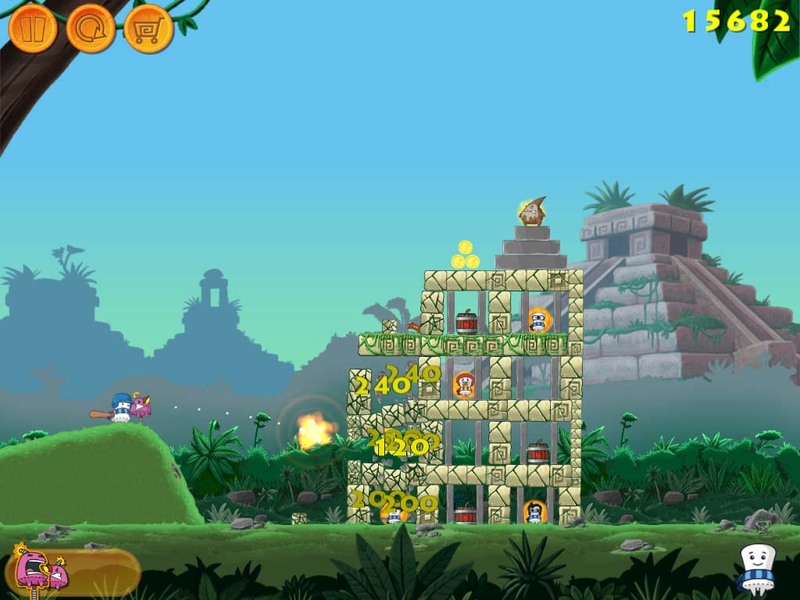 Blocks explode and there are numbers all over the place, but so what? 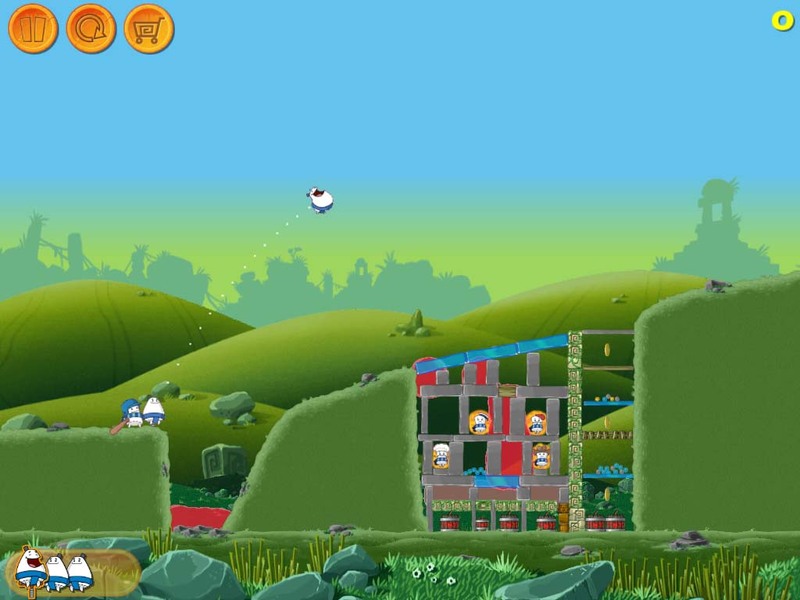 You will like this if you enjoy: The very familiar gameplay of Angry Birds / Crush the Castle. Any game that has currently popular fluid physics and cute characters. The good news: It’s a hell of a lot better than I’m making it sound. It looks very nice and the water/jelly fluid effects are excellent. 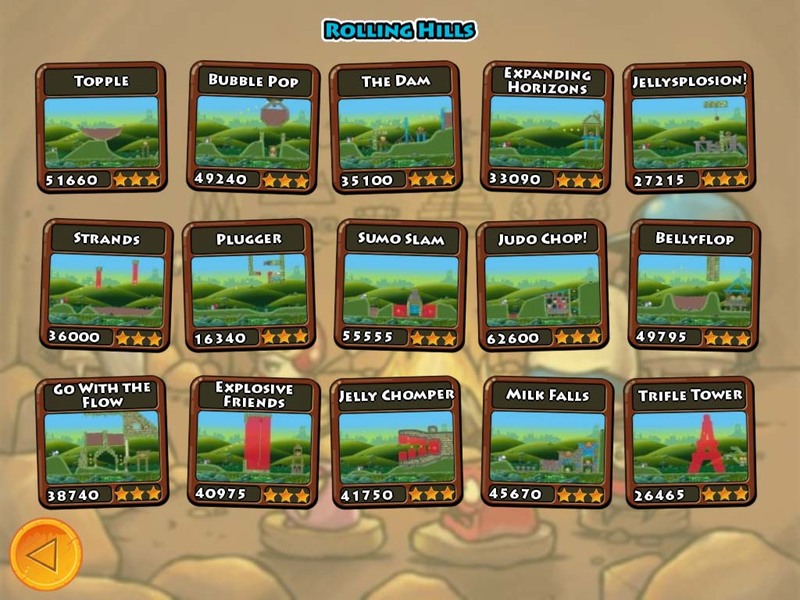 Plenty of levels, now with another 15 added in update 1.04. The bad news: It’s only ever going to be compared to Angry Birds and, as such, will have trouble making an impression as a game in its own right. Too serious and cynical? Maybe, but just have a look at the app store reviews if you don’t believe me. My own personal gripe with these games – you play a level over and over until you get it “just right” (3-stars), move on and forget all about it. I’m still not completely sure whether that’s fun or a chore. Yes, I got 3 stars on all the levels. But did I have fun doing it and does that really matter? 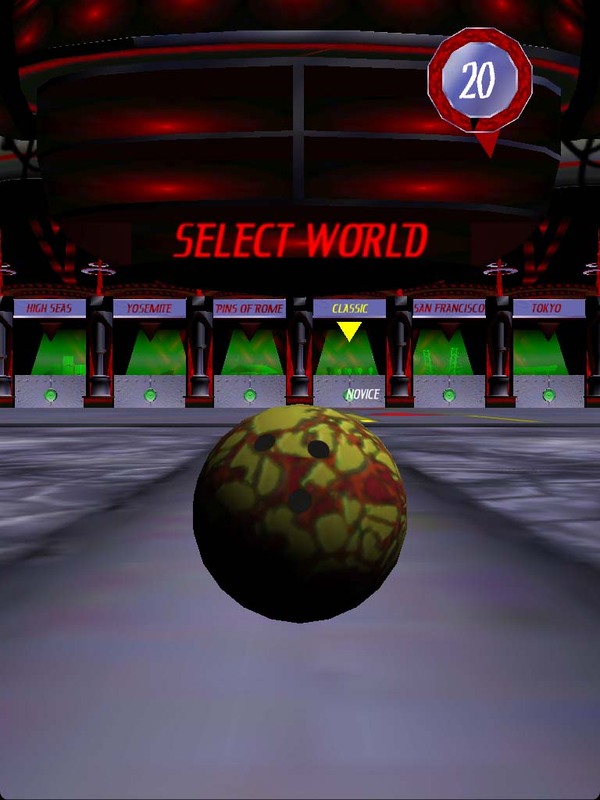 Arcadelife verdict: It’s flashy, pretty, there’s liquid splattering all over the place and it’s all rather forgettable. 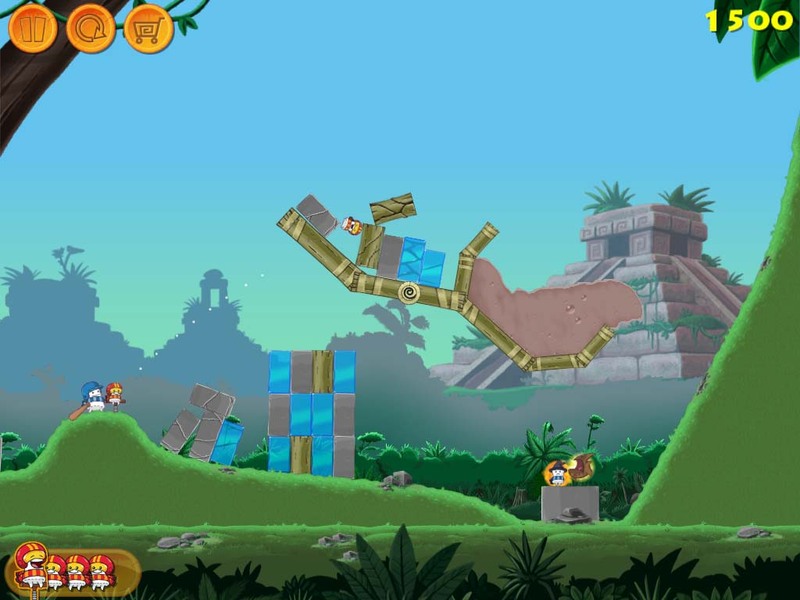 I don’t feel a burning desire to keep playing it, although what is there is technically very impressive and hard to fault as an example of how to take the Angry Birds model and add popular fluid physics into the puzzles. 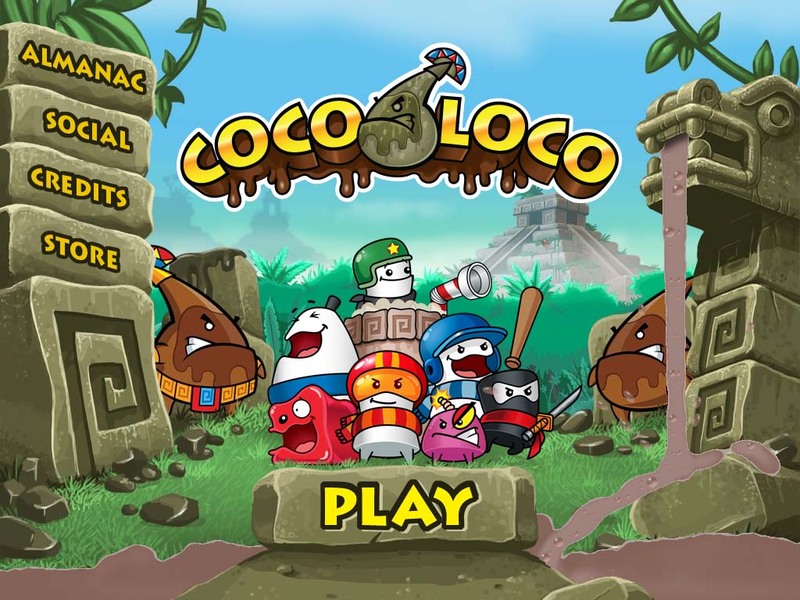 A lot more could have been done with the component parts of this game, rather than just an obvious AB imitation, but that’s how it is with 90% of the games on the app store and my opinion is hardly going to change that, is it? Ultimately, if you take a one-trick pony and give him a pink neon saddle and flashing hooves, most people will still see that he’s the same old one-trick pony. It's all fluid physics and exploding stuff, but there's virtually zero opportunity to think laterally or solve a puzzle in any way other than the rigidly prescribed 3-star method. 10 word description: Be the ball. 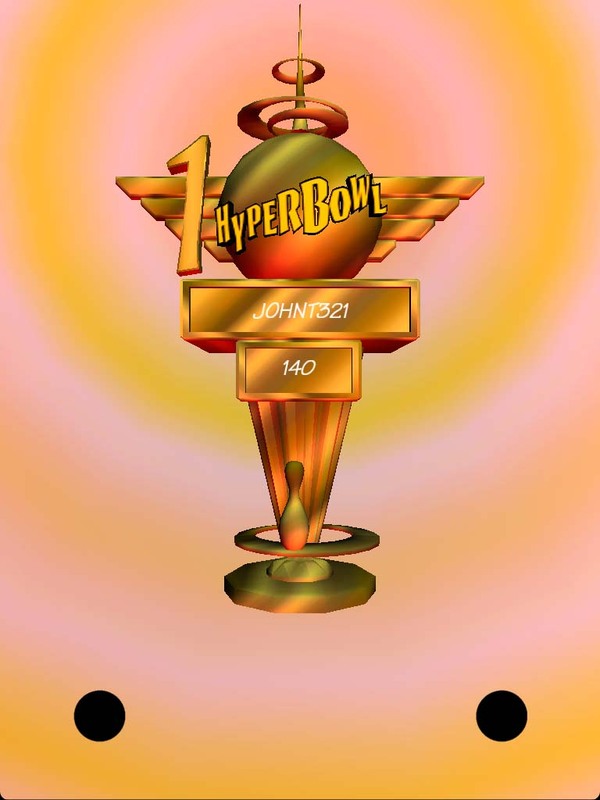 Authorised version of Hyperbowl for iPhone & iPad. (Taken from app store description). 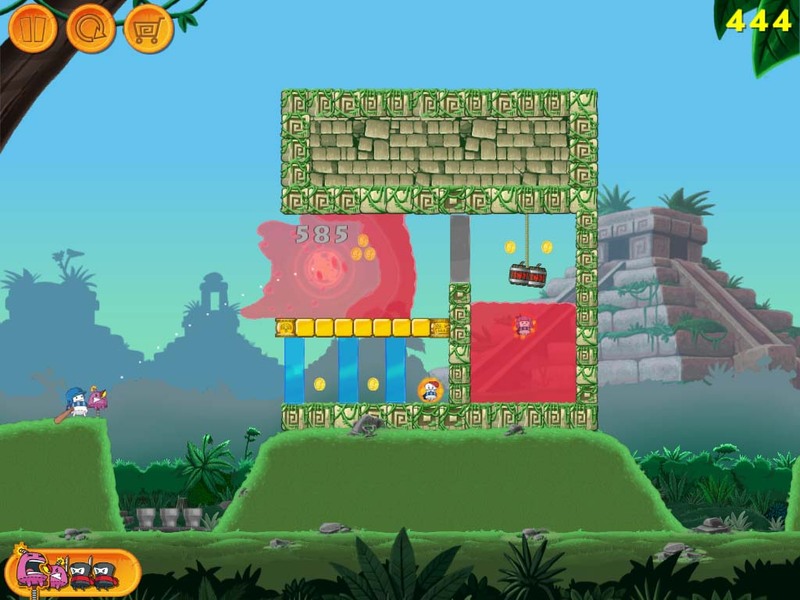 10 word review: A good idea, marred by trundling gameplay and odd physics. 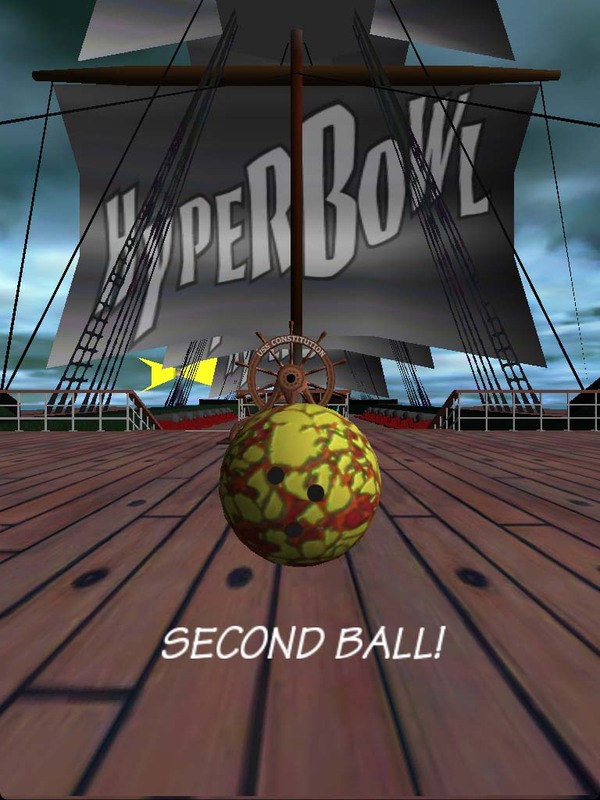 You will like this if you enjoy: Swiping a bowling ball along with your finger and seeing it shoot ten feet into the air when it touches a flower. The good news: There’s a good game in there somewhere. The bad news: It’s all too slow, blocky and unconvincing. After a couple of rolls I just wanted it to be over. I tried other lanes (countries) and it was the same story. Tedious score animations every shot – why? Pop-up “Play/Options/Quit” menu as soon as you go into the lane choice screen – why? Arcadelife verdict: Speed it up, add options to turn the score animations off and not have the “Play/Options/Quit” menu pop-up every time you go into lane choice. While you’re at it, add a “go back to lane choice” option to the pause menu. Fix the weird physics and at least add an option so we don’t have to always play ten frames. The concept is excellent; the execution on idevices, well, not so much. Setting the roll speed slider to maximum improves the game slightly, but also raises the question – why not just have it set like that by default? 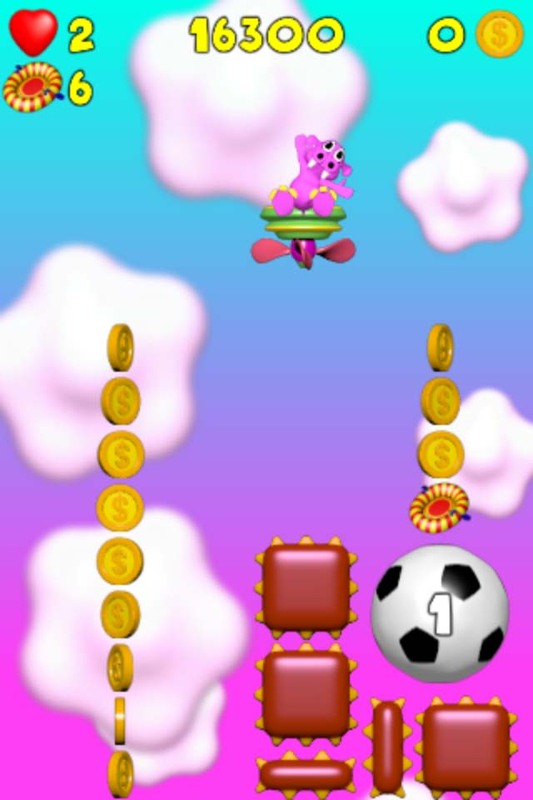 10 word description: Jump, bounce, fly, float and ride the skies. 40 levels. 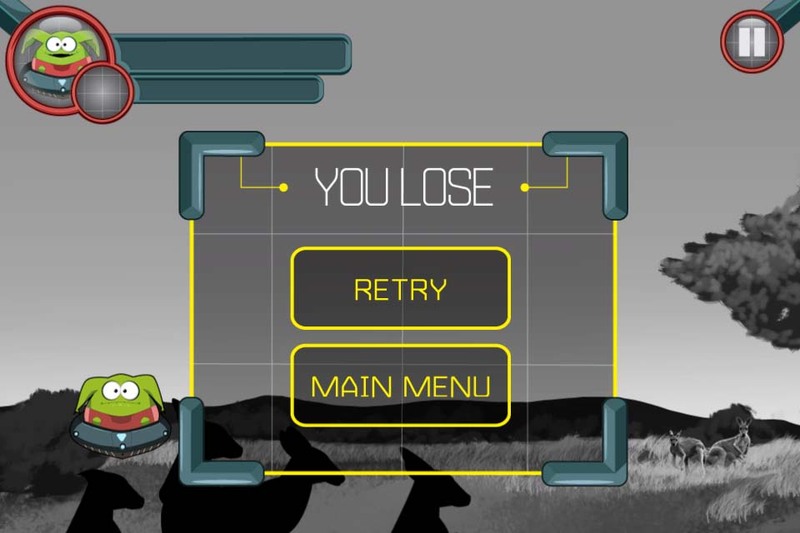 10 word review: Not just another endless jumping game; surprisingly entertaining and varied. 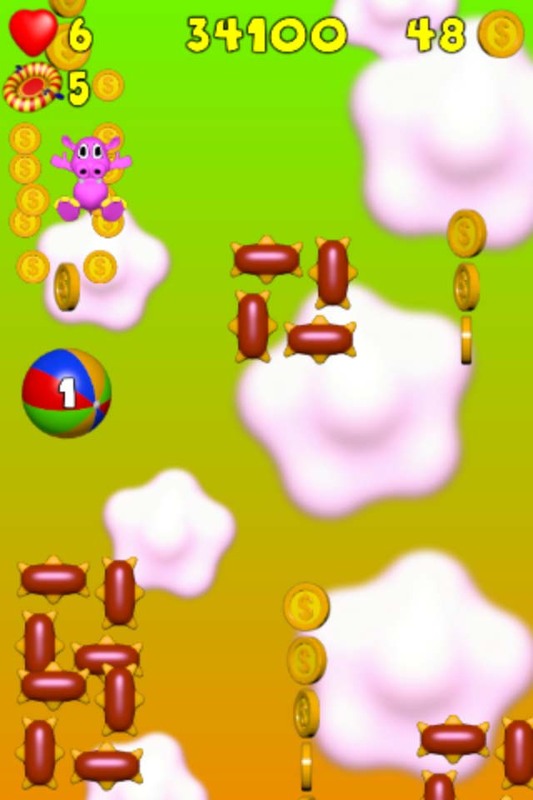 You will like this if you enjoy: Casual bouncing / jumping games, although this isn’t one. What's this? A boss fight! The good news: Very nice graphics. Controls are ok once you figure out what you’re supposed to be doing. Three optional control methods: tilt, virtual pad and a relative touch option that I prefer. 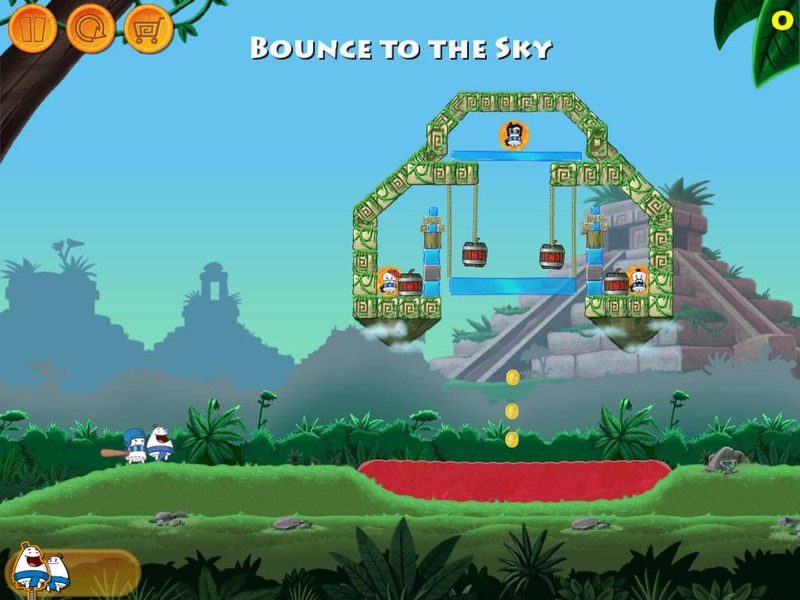 Good blend of falling, bouncing and flying and some added puzzle elements as you progress through the levels. No IAPs. The bad news: It will suffer because of the shortcomings of similar, lesser games and the fact that the screenshots make it look less interesting than it is. Also, there’s no music and the sounds are a bit generic and bland. 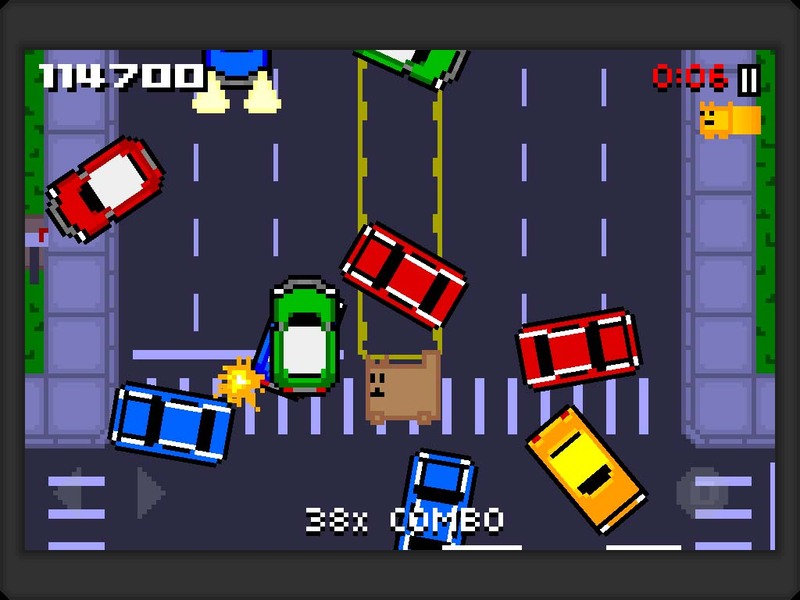 Arcadelife verdict: There’s quite a lot of cute looking, varied entertainment in this game. 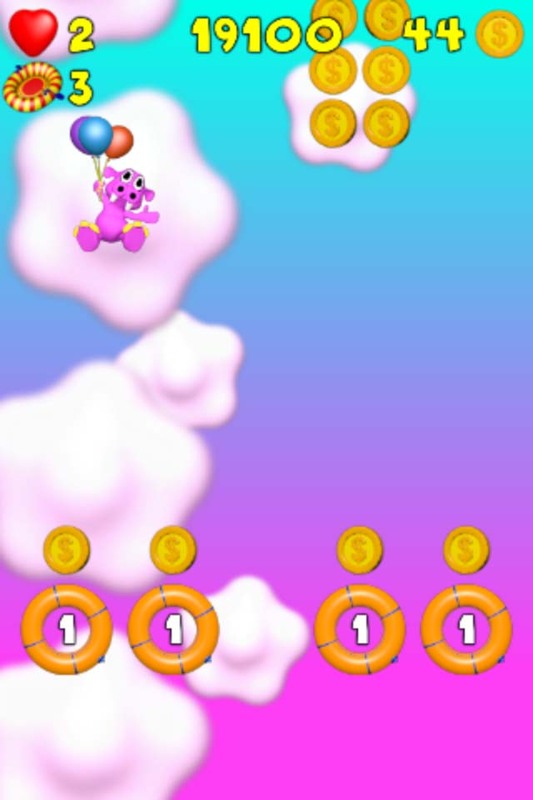 The basic objective in most levels is to collect enough rubber rings before you eventually reach the water, otherwise you fail the level. 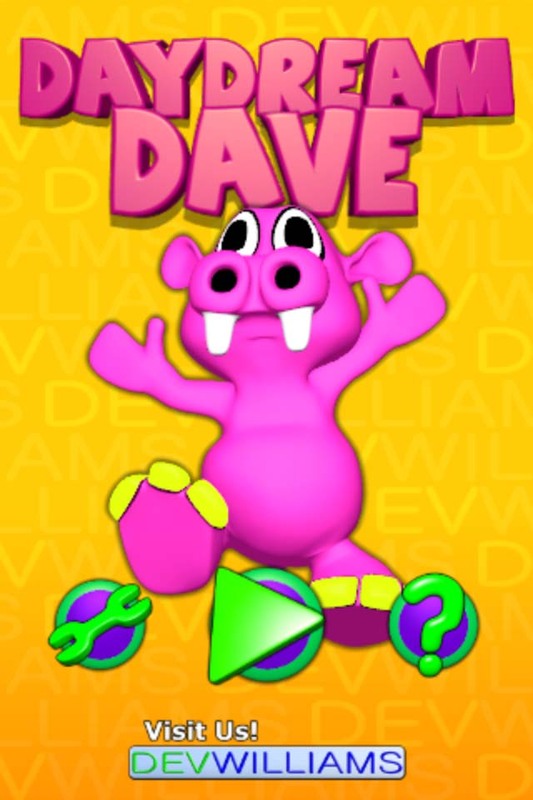 Dave falls unless he is bouncing off something, flying with one of several collectable power-ups, or responding to your attempts to make him jump in mid-air. It could be the next big casual game, but it won’t be because life just isn’t fair. Have a nice day. 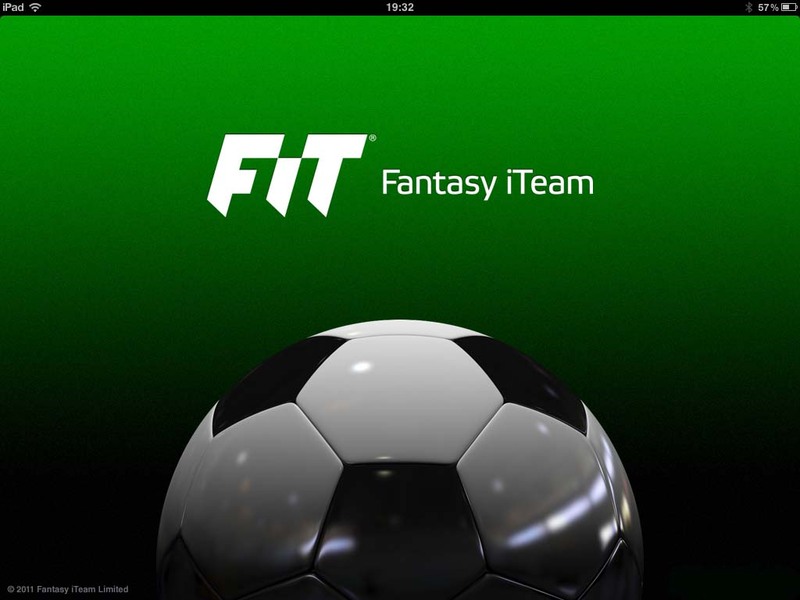 10 word description: Dedicated iPad version of popular mobile fantasy football game FiT. 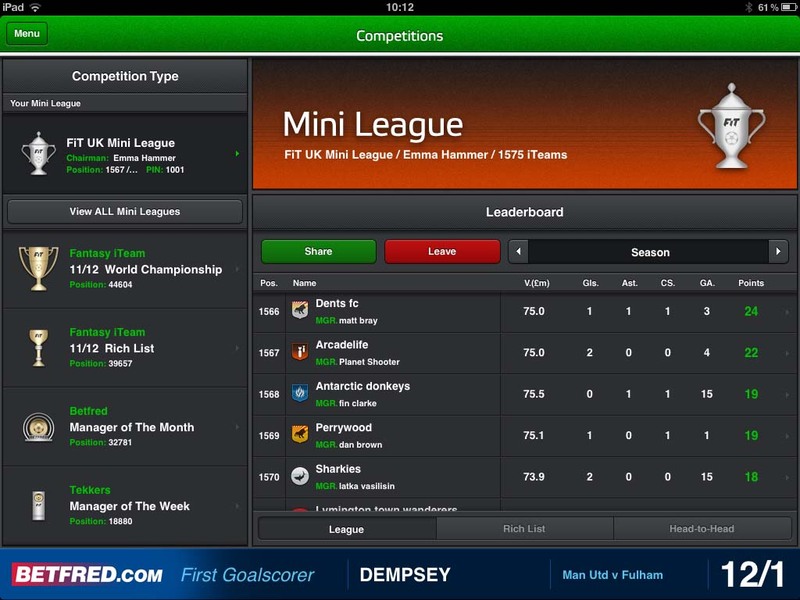 10 word review: If you’re into fantasy football, you probably need this app. You will like this if you enjoy: Football. Fantasy football. The good news: Even someone who has zero interest in football (e.g. 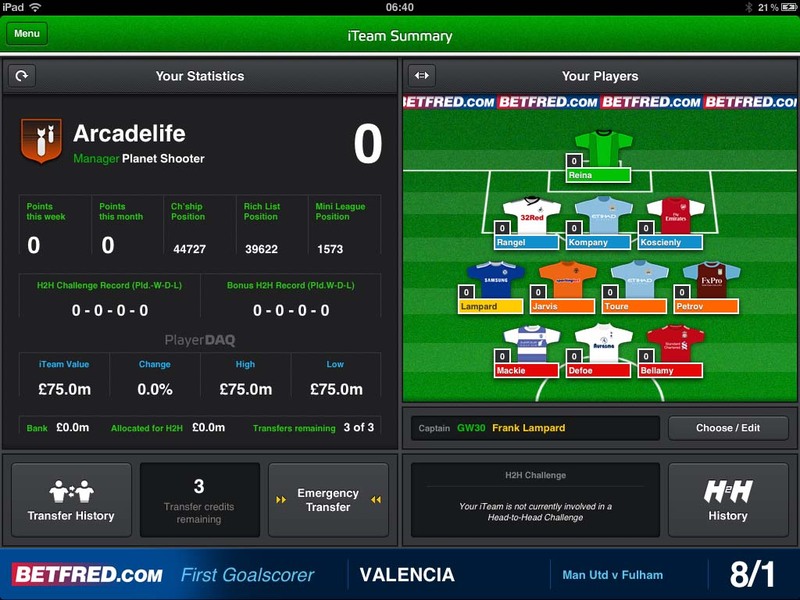 me) can get set up, choose a team and start scoring points very easily. The presentation, interface and functionality all appear to be of a very high quality. There are all sorts of mini-leagues and head-to-head competitions. The lists of players and all the individual statistics are clear and very detailed. 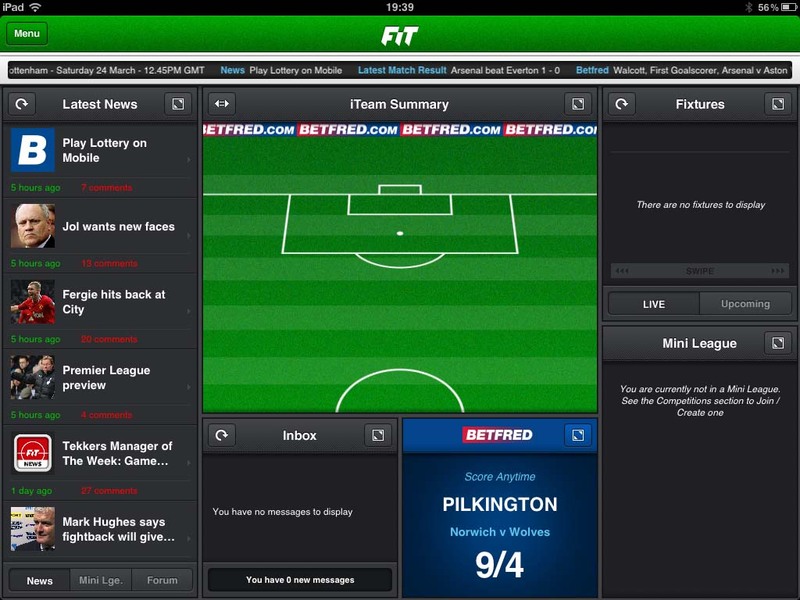 The bad news: There are buttons and links to Betfred all over the place. Even if I was interested in football, the constant invitations to waste money betting on it would start to irritate me very quickly. 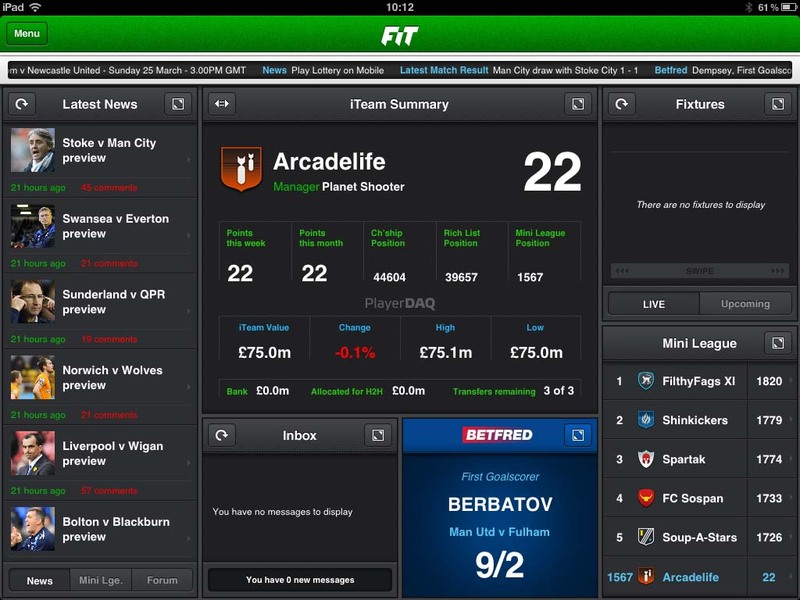 Arcadelife verdict: Much as I inexplicably became temporarily hooked on Championship Manager back in 2000, there is a kind of RPG style “my stats are better than your stats” appeal here that almost transcends the subject matter. Almost. I can’t pretend to like football and I can’t genuinely drum up much enthusiasm for picking a team of random players in the vague hope that they manage to score or stop a goal on any given weekend. However, if you’re one of the many millions of people who enjoy confronting fellow football loving co-workers on Monday morning with a jolly laugh and “We won, you lost” style haranguing, and you also own an iPad, get yourself onto iTunes and download this freebie, as it’s guaranteed to make your entire day. 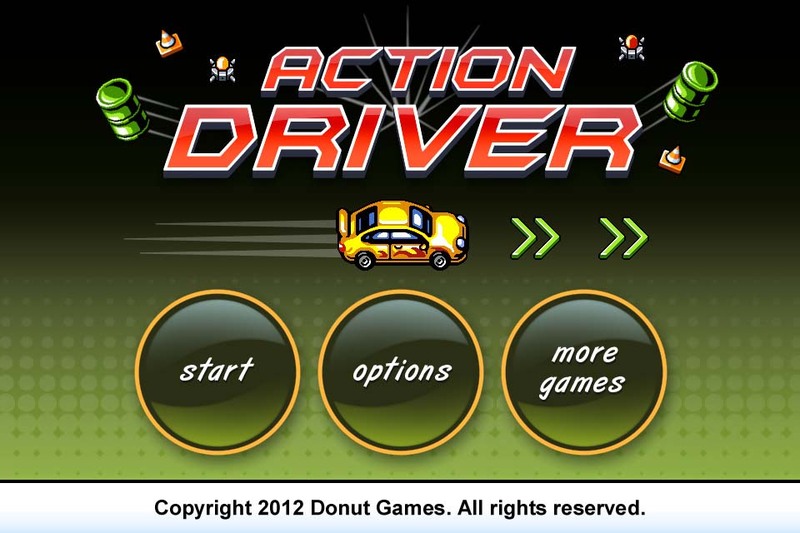 10 word description: Take a spin on the chaotic roads in Action Driver. (copied from the app store description). 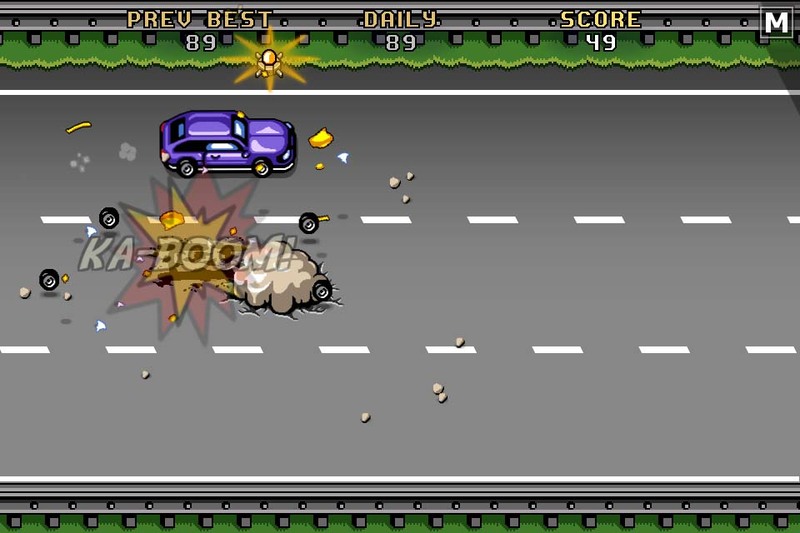 10 word review: Endless running with fast cars and explosions. Gotta love that! You will like this if you enjoy: Donut Games. 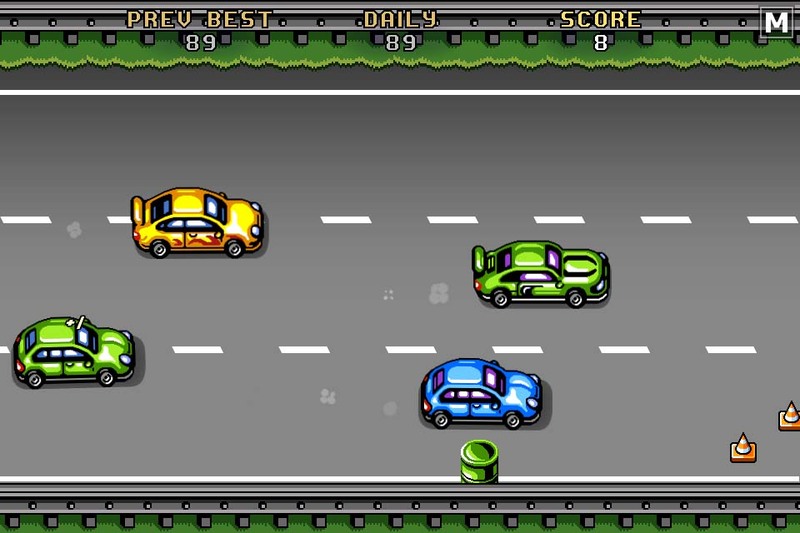 Endless runners. 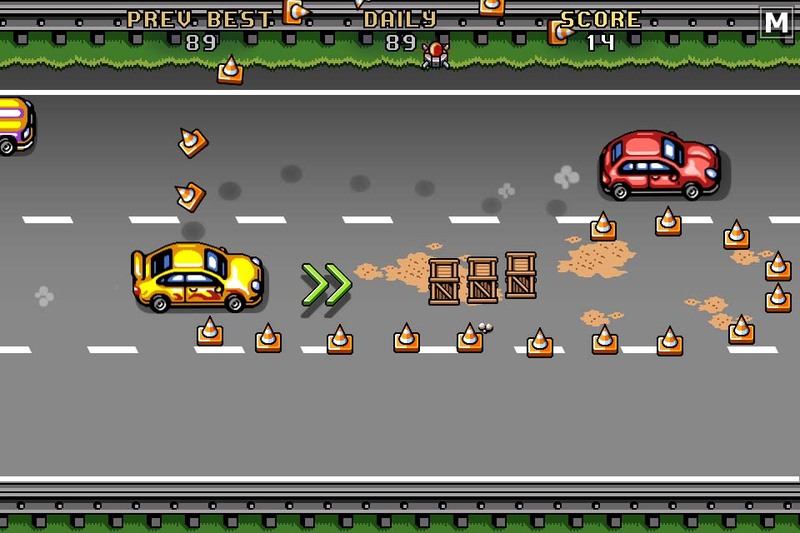 Racing the same randomly generated road of hazards over and over again. 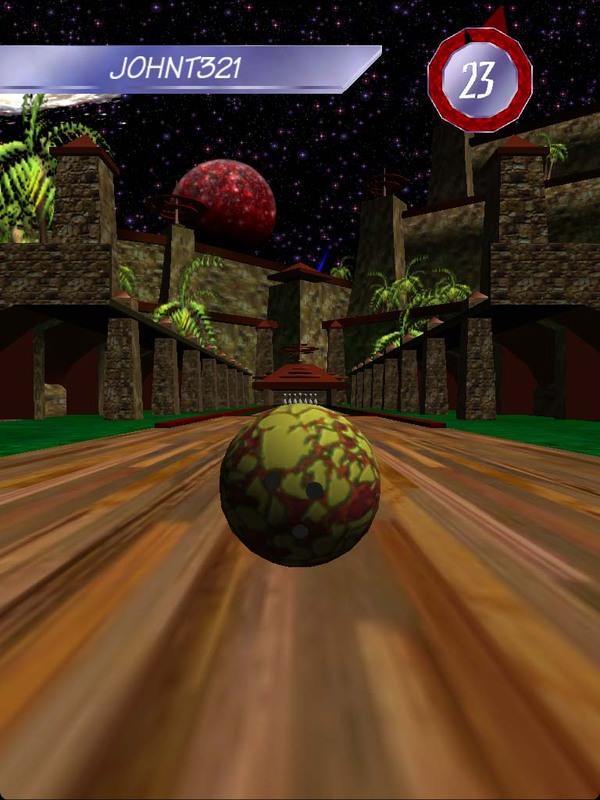 The good news: Another classic pick-up-and-play, 5-minute-burst casual game from Donut. 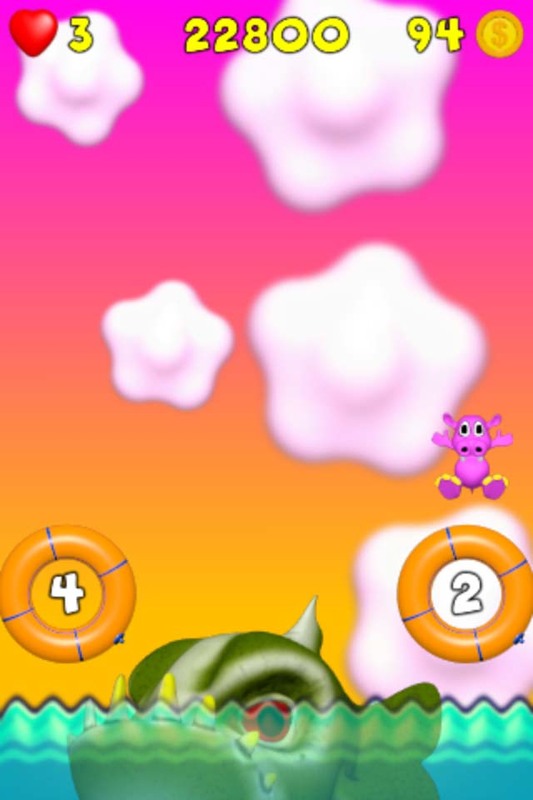 Looks, sounds and gameplay are pretty much all near the usual standard for a Donut game. Two different control options. Lots of achievements. 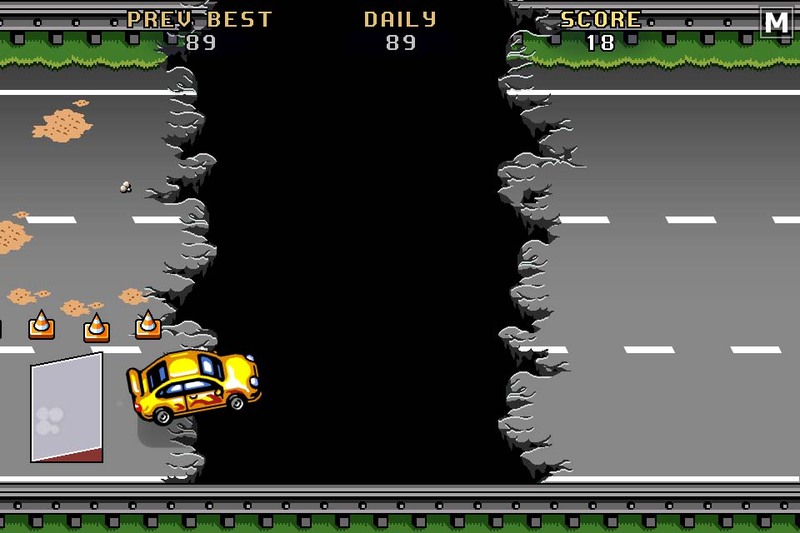 The bad news: It won’t change your life and it’s not as imaginative as their previous game, another variation on the endless runner theme, Fishbowl Racer. 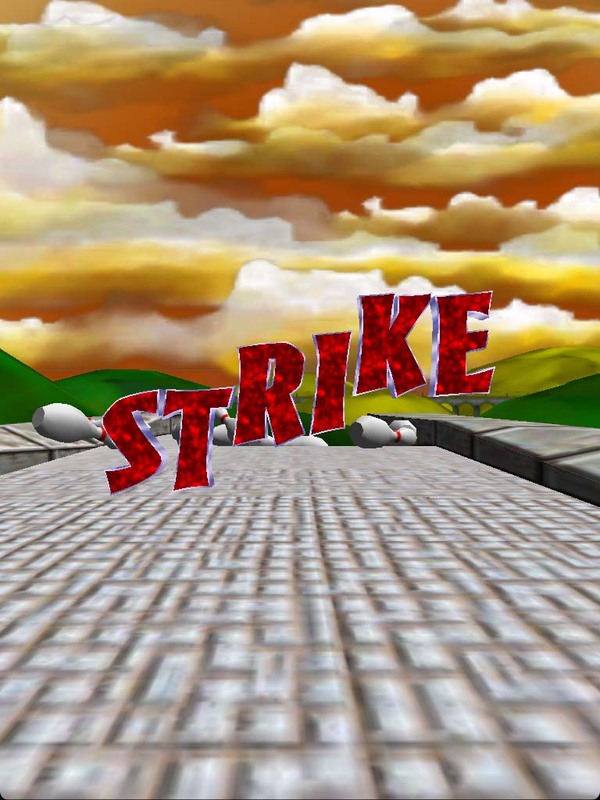 Anyone with an aversion to endless runner style games won’t like this. Arcadelife verdict: Pretty good. I played it for a solid 30 minutes (I know, because I got an achievement for doing it) and didn’t get tired of it, although I did keep getting better. 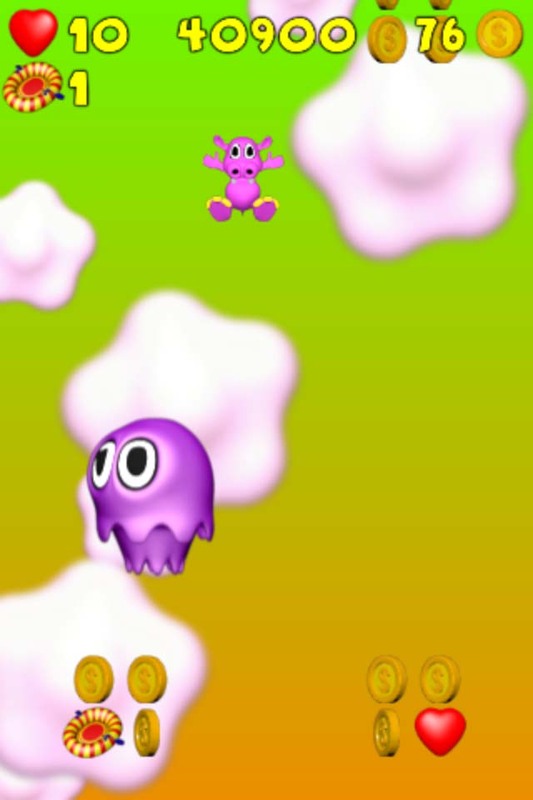 There’s plenty of action and a variety of hazards and enemies, most with their own associated Game Center achievements. If you are a Donut Games fan, or you want to cram as many endless runner style games as possible on your iOS device, this would be well worth getting. 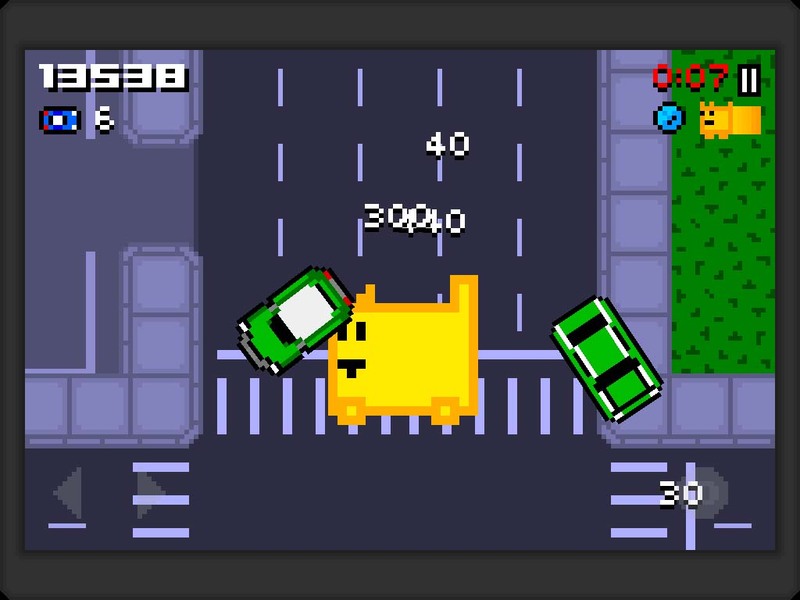 You are currently browsing the ArcadeLife : Life vs Video Games blog archives for March, 2012.